We know that using personalization in marketing works, and not just in isolated incidents either. In looking at case studies across industries and channels, from email to web to location-based marketing, it produces amazing results. But consumers are worried about the use of their personal data: 96% of American consumers are concerned about data privacy, and 80% of consumers have changed their privacy settings. Today's customers have legitimate worries over the type of data marketers want to use in messaging, and advertising. 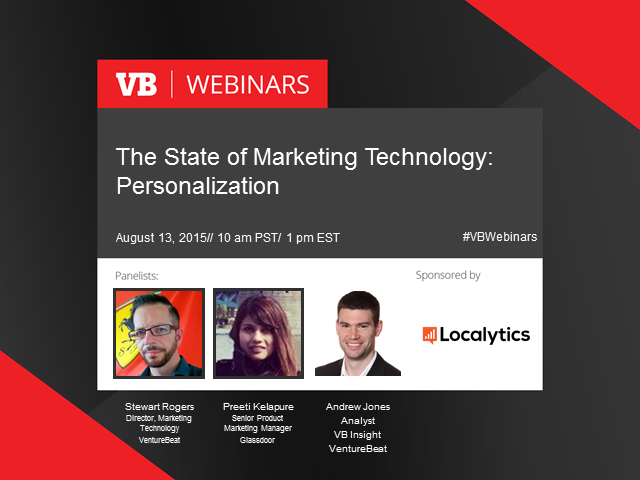 In this webinar we'll deliver the latest research into how consumers feel about personalization. We'll tell you what consumers want, what they hate, and best practices on how to introduce personalization without being "creepy." * Find out the marketing technologies that will save all marketers from crossing the "uncanny valley" into "Creepyville"
This webinar will be based on Stewart Rogers’ VB Insight report, which released on July 22, 2015.